What Bumblebee lacks in size he makes up for in bravery. As one of the most courageous and stealth Autobots, he braves missions that most bots dare not -- like staking out in a Decepticon base for 24 hours, alone. Ah, Bumblebee. Such a mainstay character ever since his appearance in the Generation 1 cartoon series, Bumblebee has been EVERYWHERE in recent years. Funnily enough, I don’t recall ‘Bee doing anything that fantastical, funny, or impactful throughout the entire G1 cartoon (but maybe my memory serves me incorrectly). Enter the 2007 live action movie Transformers, and now Bumblebee is a kung fu master, deadly fighter, and main character in every subsequent iteration of Transformers media. I don’t have a soft spot for the character, nor did I own his G1 toy. The only Bumblebee I had ever owned was G1 Goldbug (if you count that) and Classics Bumblebee, which is itself a pretty great toy. There are approximately 6.31 bazillion Bumblebee toys that have come out since Generation 1, so I’ll spare the details. What you really want to know is if this Bumblebee is worth your ten bucks? 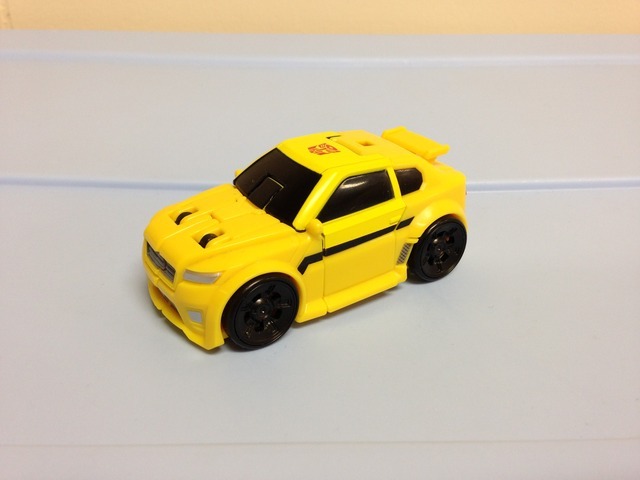 Bumblebee’s alternate mode on this go is a generic hatchback sports car similar to that of a Chevy Sonic. The car mode is compact yet a bit boxy, and features a nice little spoiler and some side view mirrors. The detailing is appropriate, and isnt’ overdone with tons of lines everywhere. There are some nice little touches here and there like the side vents on the rear fenders, adding to the detailed look. 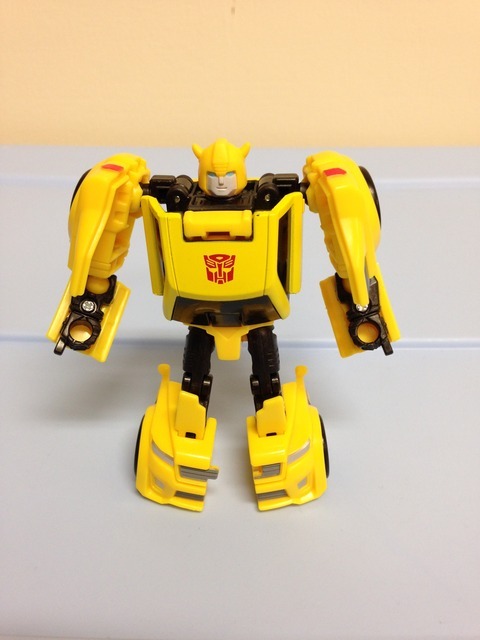 There are few paint apps on Bumblebee, but they are done tastefully. There’s a black stripe down the side, silver vents on the rear fenders, silver grill and headlights in the front, and red taillights in the back (which are sadly only half-painted). A red Autbot symbol adorns the top of the car – speaking of which, the top is done in a different plastic (black) than the rest of the car, leading to some yellow paint that doesn’t quite match the rest of the body. It’s not a deal breaker, but definitely noticeable. Mentioning the top of the car leads me right into the play features – the ‘cockpit’ of the car open up to house a little Titan Master. Now, you would normally think this is a cool feature, just like it is on TR Wheelie. However, the top piece, while done in a different plastic, is solid black plastic. That means while you can stick a Titan Master in there you can’t see him, which pretty much nullifies the fun. I mean… c’mon Hasbro! You made the piece different from the rest of the car and couldn’t cast it in transparent plastic?! On top of that, the way it opens is really funky – I fully expected the part to open from the front edge of the windshield. Nope. It opens from the rear bumper, revealing a large door that leaves 1/3 of the entire car open for business. It’s tricky to get open and closed, and sometimes (at least in my hands) it pops off its hinge. To be honest, it would have been a really cool feature had the windows been transparent and the door operated differently, but you don’t need to use it. But it really does destroy the whole point of the line. Otherwise, the car is tiny and rolls really well, and I find myself playing with it regardless of the lack of functionality. 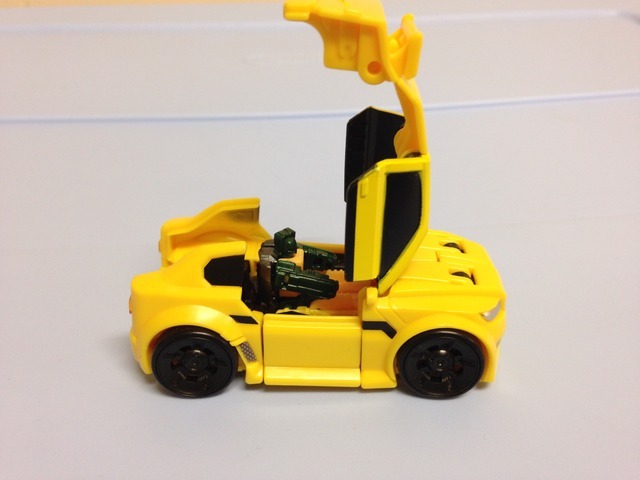 Opening the aforementioned cockpit allows you to shift down Bumblebee’s arms. Fold that cockpit up and peg his neck area down to it. Flip out ‘Bee’s legs and you’re all set. The transformation is simple and easy with the only frustration is getting the legs/feet back into car mode. It’s not the pinnacle of engineering, but the way the top of the car is handled is something that I hadn’t seen yet. I was pleasantly surprised at how fun Bumblebee is to fiddle with. Anyways, opening Bumblebee up shows that the large Autobot symbol now resides on his chest – after which you will find that no other paint apps are present, unless you count the detailing on his face. The head mold is pretty great; it’s round a cherubic, just like Bumblebee should be. The grey face paint and blue eyes work pretty well too. Other molded detailing is pretty sparse, but it fits the character and design well enough. The only issue I truly have with the mold design is that the upper arms/shoulders are really bulky. From the front it’s not that noticeable, but from the side the car parts take up an insane amount of space. You know what though? As big as they are, they aren’t hindered so it becomes more of an aesthetic issue than a functionality issue. 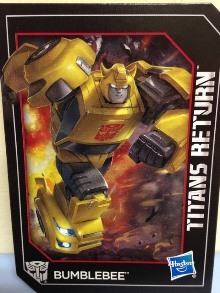 Speaking of functionality, Bumblebee uh… stands there. He’s got good articulation though, and I’ve put him into some great running poses without issues. His joints have a good range of motion, and his hands are designed with 5 mm pegs for weapon handling… if you’ve got some fairly tiny ones lying around. Yeah, I guess he doesn’t really do to much, but he’s a squat little Bumblebee that fits more in line with his original mini-bot scale. Overall, I appreciate the figure for what it is: inexpensive, fun, and small in scale. Bumblebee surely won’t knock your socks off, but I found through writing this review that I actually like him more than I thought I did. Transformation Design: 7/10. Not earth-shattering, but there’s a couple neat things taking place that I hadn’t really seen before. Durability: 6/10. There’s some tiny flaps and tabs here and there that I worry about on the legs. Fun: 6/10. I fiddle with this guy a lot. But honestly the lack of transparent windows wrecks the Titan Master feature. Aesthetics: 7/10. He’s alright. ‘Bee looks pretty good (and bright) in both modes, except for the bulky shoulders. Articulation: 8/10. For a little guy, the range of movement is great. Value/Price: 6/10. For $10 USD, I really wish the Titan Master functionality was better. As is, the toy doesn’t do a whole lot. Overall: 6/10. Bumblebee is fairly good all around. Do you need to search the ends of the earth for him? Absolutely not. Had his play features worked better, I think I would have scored this more in the ‘8’ region. With that out of the picture, you get a simple ‘bot with two simple modes and no weapons.